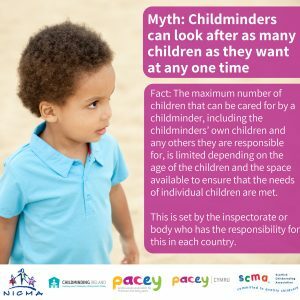 Fact: The maximum number of children that can be cared for by a childminder, including the childminders’ own children and any others they are responsible for, is limited depending on the age of the children and the space available to ensure that the needs of individual children are met. The average number of children Childminding Ireland members mind is 3 at any one time and they are insured to mind a maximum of 6 children. If a childminder is minding more than 6 mixed aged children at any one time, they must register with Tusla. A childminder who is required to register should apply to register as a pre-school childminder if they care for more pre-school children than school age children, and as a school age childminder if they care for more school age children than pre-school children. For further details on how many children a childminder can mind, visit our webpage. Click here to view the video about this myth.